Treatment for addiction comes in many forms. No single program will work for everyone, and understanding the options available can help with the decision process. Who Answers? to speak to a helpline support specialist, who can help you determine which type of program is right for you. Inpatient addiction treatment takes place in a residential setting. Patients stay at the facility for the duration of treatment, which allows them to escape temptations and triggers at home and focus on recovery. Treatment services include detox, medical supervision, group therapy, individual therapy, 12-step meetings, recreation, and other health and wellness activities. Luxury residential treatment is a more lavish inpatient experience, complete with amenities such as a pool, spa, yoga classes, or acupuncture. Executive inpatient programs] are similar to luxury programs,[/link with privacy and the option to continue working while at the facility. Luxury and executive treatment programs will generally be more expensive than their more standard treatment counterparts. Outpatient treatment is a type of substance abuse program that allows an individual to continue living at home throughout addiction treatment. These programs require regular check-ins for individual or group treatment sessions, so patients must be self-motivated and committed to recovery. Outpatient programs can be challenging for those who have repeatedly relapsed, struggle with relatively severe addictions, or have mental, medical, or polysubstance abuse issues. An intensive outpatient program (IOP) is an option for individuals who opt for outpatient programs, but benefit from a relatively structured program. These programs meet multiple times a week for therapy and counseling, with a focus on relapse prevention. Some programs will conduct regular drug testing to assess for continued sobriety and to encourage patient accountability. In a partial hospitalization program (PHP), the recovering individual checks in weekly at a hospital for medical monitoring and treatment. Partial hospitalization is focused on ensuring stability for patients with medical needs that a regular outpatient program can’t treat. Alcoholics Anonymous is for those recovering from alcohol abuse and addiction. Narcotics Anonymous is for people recovering from drug abuse. Al-Anon and Nar-Anon are 12-step programs for addicted loved ones. A dual diagnosis means that a person is struggling with both a substance use disorder and a mental illness. Sometimes, substance abuse can trigger a mental disorder. In other cases, a person with a mental illness begins abusing drugs to self-medicate. Dual diagnosis treatment can address both issues to help a person through recovery. If you need help deciding which type of substance abuse program is right for you or your loved one, contact us today at 1-888-319-2606 Who Answers? . Detox centers help people during the detoxification or detox stage of addiction treatment. Detox is the process of remaining abstinent until the substance has cleared the body. It is the first step toward recovery. Detox often results in withdrawal symptoms in those who are addicted or have developed physiological dependence. Depending on the substance, withdrawal syndromes may range from minor discomfort to life-threatening complications, such as seizures. Medically assisted detox can ensure the safety of those beginning their recovery. Therapy can be an invaluable resource during treatment for addiction. Addiction therapy sessions can help recovering users recognize why they began abusing drugs or alcohol. It can provide them with the skills to identify, avoid, or react to high-risk relapse situations and allow them to practice coping mechanisms in the face of cravings. Individual therapy is when the therapist and the patient work together one-on-one. It offers the most personalized care and fosters a strong therapist-patient relationship. 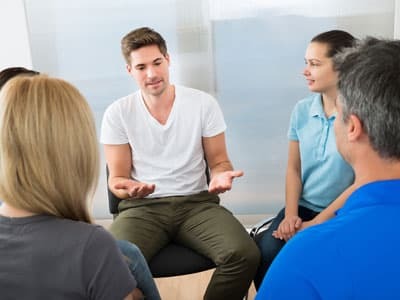 Group therapy involves working through therapy among a group of sober-minded peers who are experiencing a similar struggle. This kind of therapy can offer a support group where members understand each other’s challenges and can provide encouragement to one another. Family therapy is when the recovering user works through therapy with members of their family present. This kind of therapy help family members of substance abusers understand their loved one’s plight. Everyone learns how to support the individual’s abstinence without enabling future use. Medication-assisted treatment can help patients manage withdrawal symptoms and cravings. Some of the medications approved to treat substance dependence have special properties or are formulated to prevent abuse of the drugs themselves, as well as abuse of the substance being treated. If you or someone you care about is struggling with substance abuse, find help today. Call our hotline at 1-888-319-2606 Who Answers? to speak with a treatment support advisor about finding the right type of addiction treatment for you.